Washington, NJ: A bulk container packer from process equipment manufacturer The Witte Co., Washington, New Jersey (www.witte.com), gently vibrates flexible bulk bags, Gaylords, intermediate bulk containers and other bulk shipping containers to increase their bulk density for improved efficiency in packaging, material handling and warehouse operations. Applying linear vibration from underneath the bulk container, the Witte vibrating packer creates a fluidizing action that densifies the material by removing air from in between the particles while protecting particle integrity, shape and size. The added density and rigidity help cube out trailers while supporting safe handling, palletizing, stacking and shipping requirements. Ideal for compacting food, beverage, chemical, pharmaceutical, mineral, metal, plastic and other powdered, granular and pelletized materials, the Witte vibratory packer accommodates loads of up to 4,500 lbs. and is available with several options including a variable speed drive to adjust vibration speed and a roller deck that permits the bulk containers to be easily rolled onto and off of the platform. 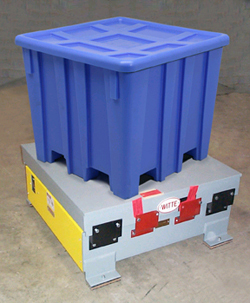 In addition, the Witte packer may be mounted directly to a scale platform to combine weighing and densifying in a single unit.